A couple of books on sketching architecture. 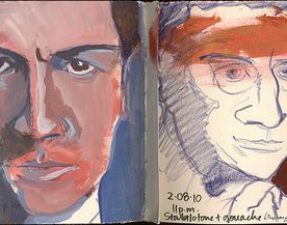 Above: The final journal spread from the recent Sketch-Up has two "insert" drawings (at the top right and left) over an uncompleted sketch. (I was looking down from the 22nd floor, straight down, and found I had to hold the book tilted forward, and lean forward at the same time—my back won the argument! 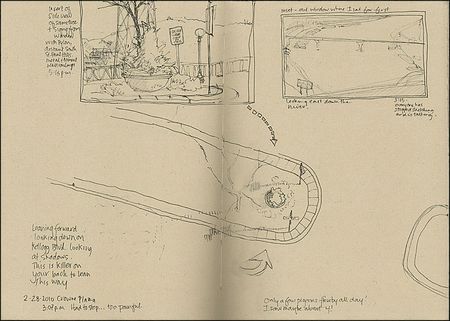 The top right drawing is actually a floor level view looking out at the median strip I had been sketching from above. I drew it as I was leaving that day.) Magnani Annigoni Designo paper. See additional drawings of mine and other attending artists in my report on the Sketch-UP and over at Urban Sketchers—Twin Cities. If you're like me you might have several books on perspective drawing, which, having read once, you set aside and instead continue to wing it with a "this relates to that in this way, and so on" approach. Some of you may actually put into use all the wonderful rules and "suggestions" these books put forth. Whichever camp you're in you might enjoy a look at these two books off my shelf. The first is "Freehand Sketching: An Introduction" by Paul Laseau. I thought I had written about this book on the blog before but couldn't find it. It deserves another mention if I have. Laseau's slim volume is full of little exercises. He starts with contour drawings and negative space and very shortly has you breaking apart the picture plane with the straight lines necessary to capture those buildings and scenes. I think it's a lovely book that would make an excellent book for any new artist or visual journal keeper or urban sketcher on your gift list. Experienced sketchers will get a bit of inspiration and maybe a kick in the pants from it. The book doesn't try to be exhaustive, comprehensive, or glitzy. (There are no galleries and galleries of work from other artists for instance.) It is unpretentious, direct, and useful. The second book, Architectural Sketching and Rendering: Techniques for Designers and Artists, edited by Stephen Kliment is actually an older book (1984) that is a conglomeration of material from even older Watson Guptill books. This is something we see a lot of recently in the "how-to" book market—text from several books on the same subject knitted together under a new title, with an editor instead of an author. This actually annoys me, because I often have one or more of the included books. I don't like to be gulled into buying material I already own a copy of, but this book drawing on material that is long out of print and hard to find as a used book, doesn't bother me as much. In fact I like that it has nice crisp pages, no old paper smell, and saves me the trouble of digging out my Arthur L. Guptill "Rendering in Pen and Ink" book which I bought years ago at a hefty price from a used bookseller. What you have in this book, then, from a variety of sources, with an equally rich and varied supply of examples and styles, is instruction on setting up your studio, using pencils, pens, creating tone, freehand perspective, etc. You'll read about rendering buildings, interiors, and also furniture. While some of the instruction may be brief, and PLEASE do not sharpen your pencil in the manner depicted unless you want to slit your wrists (always work your knife away from your hands and fingers), it's so chockful of examples that I think you'll be inspired to go out and have a go with some different techniques. I'm looking forward to finish reading this book over the weekend and wanted to share it with you in case you were looking for a productive weekend activity. 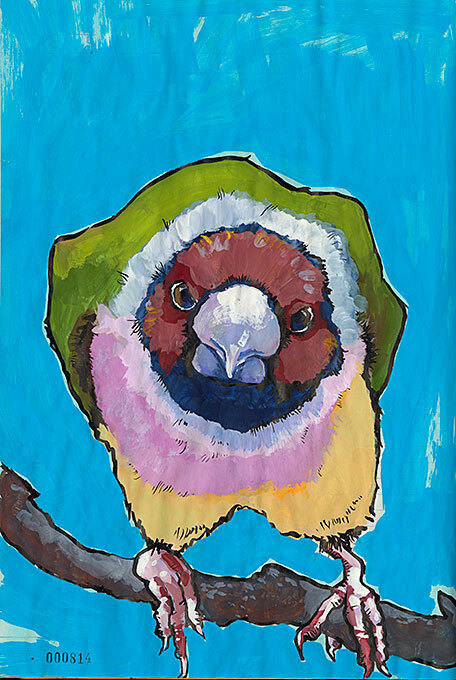 I've been trying to focus on building sketches lately just because I have a yen to capture some scenery, to widen my view from the faces of animals and birds. Just to push. Ultimately we all know that the only way to improve at something is to keep working at it. These books might push you a little in that direction. Next post: The New 8 a.m. 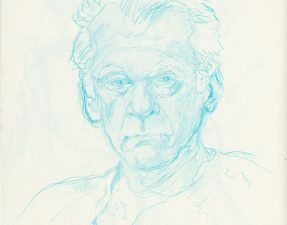 Commercially Bound Journals Drawing From Life Drawing in a Series Ears Eyebrow Update Family Hair Paper Portraits Richard Roz Stendahl Seawhite Sketchbooks Sketching Specialty Tools The Drawing Life Visual Journaling Why Draw? Oh Roz, I can so relate to this post. I have a zillion books on perspective, but when sketching have always found it difficult cuz you really can’t use V.P.’s or they would be way off your paper. So, probably like you, I just try and relate lines. But I usually over compensate an angle and the sketch ends up looking a little ridiculous. Anyway, I will look at both books (amazingly, neither is in my library), as the U of Arizona has both, so I will go there today. Thanks for the heads up. Roz, Other good books on this subject are “The Illustrated Room” by Vilma Barr, “Painting Interiors” by Jenny Rodwell, and several books by Richard Taylor,”The Watercolourist’s guide to Painting Buildings”, Painting Houses and Gardens in Watercolor”, and “Buildings in Watercolor”. There is, also, a beautiful book by Jeremiah Goodman, “Jeremiah: A Romantic Vision”. He’s considered to be one of the finest illustrators of interiors (watercolor and gouache). June, I should have asked you for more titles before I posted. I know this is a particular area of interest for you! I’m going to have to take a look at these and make a longer list that focuses past sketching onto painting! I have “Jeremiah: A Romantic Vision.” (I thought I might even have written about it on the blog but I have no blog-specific search engine still!) A friend on an email list told me about it and I ordered it right up. The paintings are WONDERFUL. Thanks for mentioning these books! Great post as usual. I LOVE Paul Laseau’s books. I bought them years ago when I wanted to start keeping an architectural sketchbook (I am an architect) and then Amazon recommended Danny Gregory’s Everyday matters … a few years later I started keeping a Danny style journal. So it was Paul Laseau’s book that was the start. Does the other book (ed Kliment) contain the same material as the old classic Gutpill – I borrowed that book from the library when I was a kid! Liz & Borromini the Kliment book doesn’t contain all the Guptill information, but it draws several examples from there in exercises and other material, as well as from other related books owned by Watson Guptill, it is, as mentioned in the review, a book knitted together from several others. But if one can’t find the others, the material in this book is one source one can at least get some of it.